Make no-sew recycled denim dog toys out of old jeans! It’s easy, fast and free! And your pup will love it! Since May 1 there’s a whirlwind in my life: A black German shepherd puppy (more pictures of her on her instagram account @khaleesi_theblackgsd). She’s a little destroyer! 😉 In the last weeks, she destroyed part of the cork floor, some of her toys, Grandma’s midcentury chair – and even her harness! So her toys have to be sturdy and robust! A while ago, I made her DIY dog toys with old T-shirts but since she’s such a destroyer (unlike my first dog) they don’t hold very long! 😉 She needs heavy duty dog toys. So this time instead of using T-shirts that rip easily I used old jeans! For all the no-sew recycled denim dog toys I used one jeans and the cut-off jeans legs that were leftover from my jeans to capri refashion. 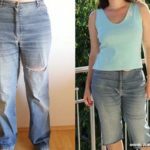 But you don’t have to use old jeans or jeans legs, you can also use old denim skirts or shorts, denim jackets, vests or coats – everything that is denim. These no-sew recycled denim dog toys are great as chewing dog toys, to play fetch and tug-of-war. 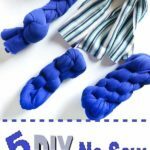 For the braided and the donut dog toy: Cut off the hems, then depending on the size of the jeans cut each jeans leg into 4 – 6 long strips. Fold the strips so that the raw edges are enclosed. You can use pins to temporarily hold the strips together. Remove the pins as you braid. The jeans waistband dog toy is perfect for chewing and playing tug-of-war. Cut off the waistband. Then cut off the button. And that’s all! 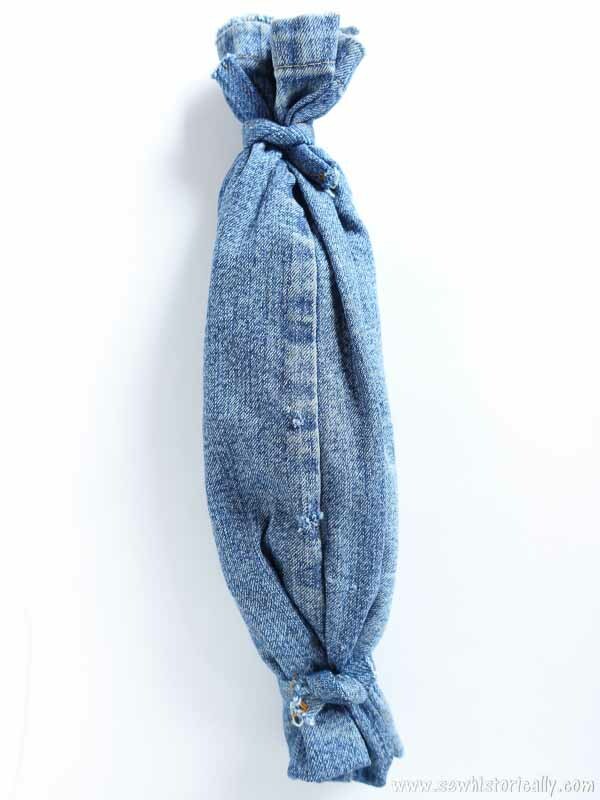 The knotted denim dog toy has a nice weight – it’s perfect for playing fetch. 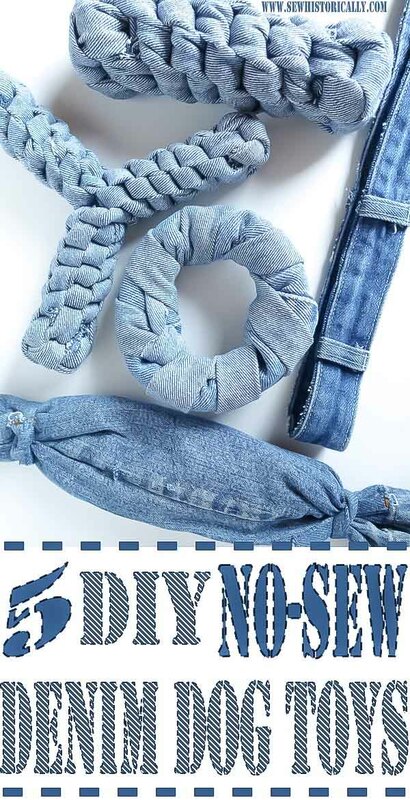 Temporarily secure four denim strips with an elastic or hair tie. Tie a series of crown knots. I used the spiral crown knot (also called round crown knot). But you can also use the square knot (also called box knot): the spiral crown knot creates a round dog toy while the box knot creates a square dog toy. Here‘s a video of how to tie a crown knot. 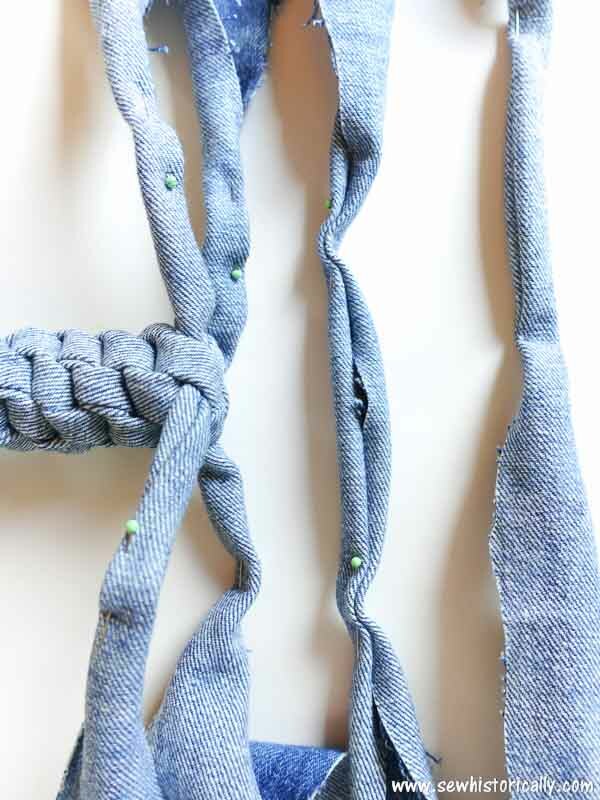 To hide the tails, push the needle-nose pliers through the knotted denim dog toy, grab the tail and pull it through the toy. Then trim the ends. 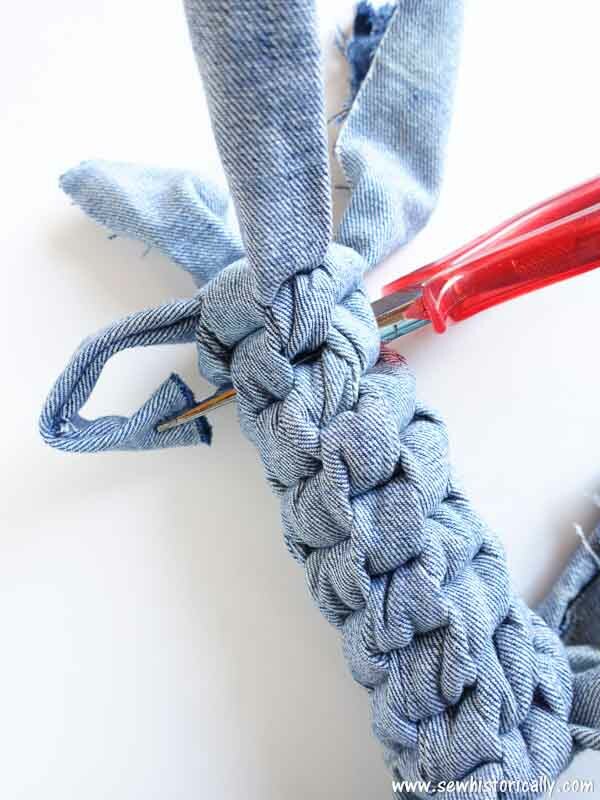 The Y-shaped dog toy looks complicated but it isn’t more difficult to make than the knotted denim dog toy. 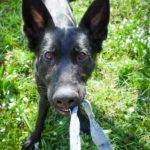 Start like you did for the crown knot (square knot) dog toy: Begin with four strips and tie a series of crown or square knots. When you reach the middle of the strips, add two more denim strips. Now start knotting in two direction – knotting together two ‘old’ strips and two ‘new’ strips. Finish the Y-shaped dog toy like the rope braided dog toy. A nautical chewing or fetch dog toy! Doesn’t the donut-shaped dog toy look like a lifebuoy? 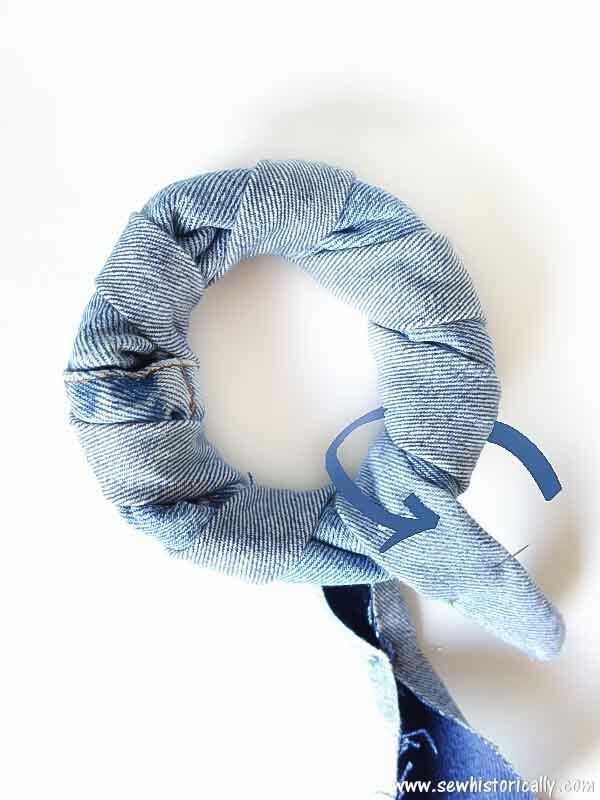 Roll the jeans leg into a donut shape like you would for a sock bun donut. 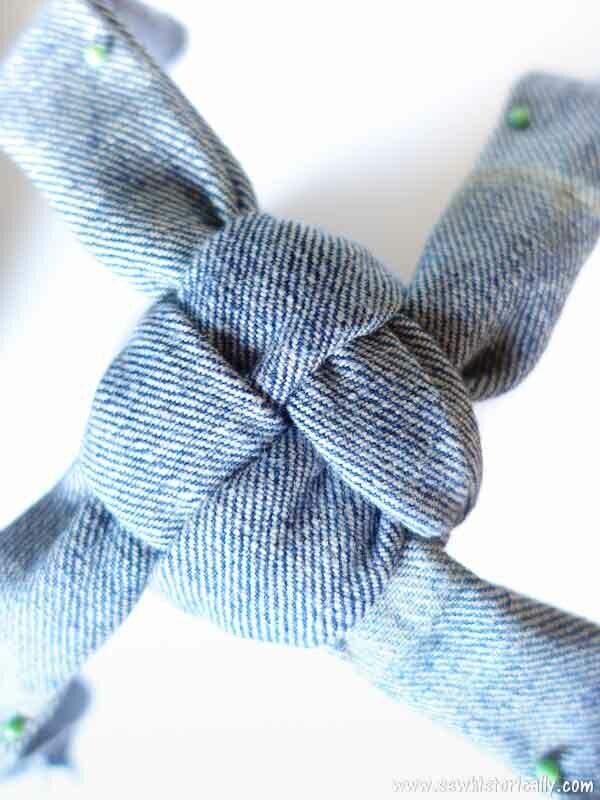 Wrap a long denim strip around the donut to secure the donut shape and tie the ends together with an overhand knot. 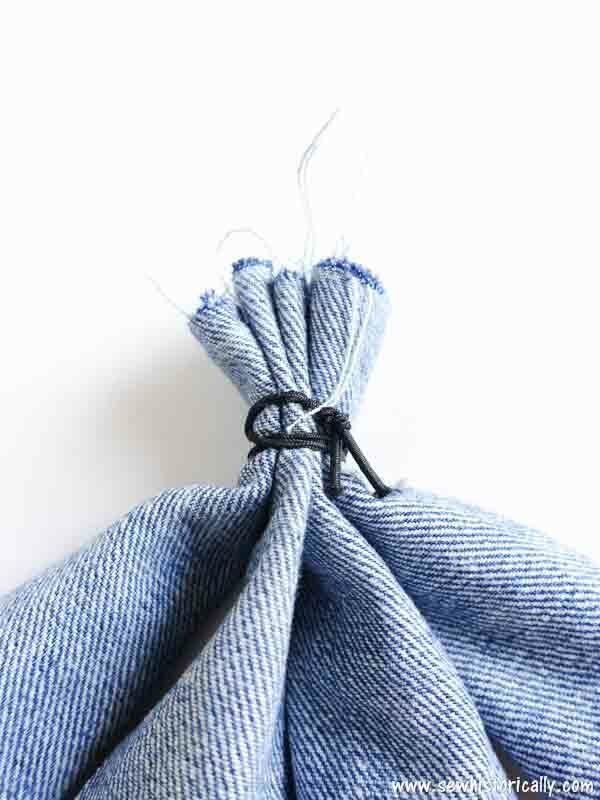 The candy-shaped denim dog toy is so easy to make! 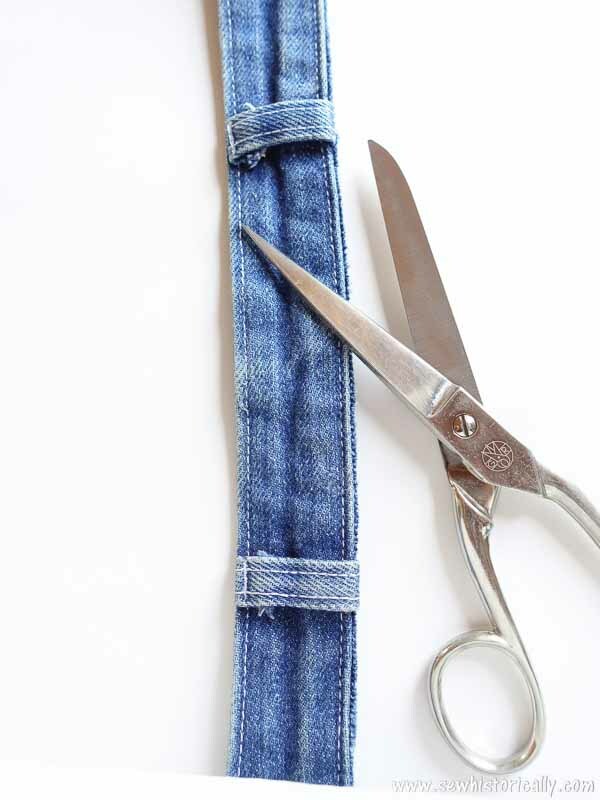 With the stuffing inside, roll the cut-off jeans leg into a candy shape. Tie the ends together with the cut-off jeans hems. 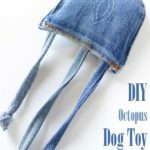 You can use the leftover pockets of the jeans to make a DIY octopus dog toy! My puppy Khaleesi loves the recycled denim dog toys. She chews on them, plays fetch and tug-of-war with us and so far they survived! On her instagram account @khaleesi_theblackgsd I share pictures of her playing with the DIY denim dog toys and how they hold up over time. 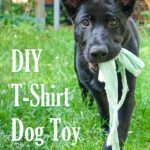 The Easiest DIY Tug Toy – Your Dog Will Love It! These dog toys are genius, I’m definitely going to try them with my dog (who is a gorgeous black lab). I have teens so seem to have an endless supply of ripped jeans so this project is perfect! These are a great idea. 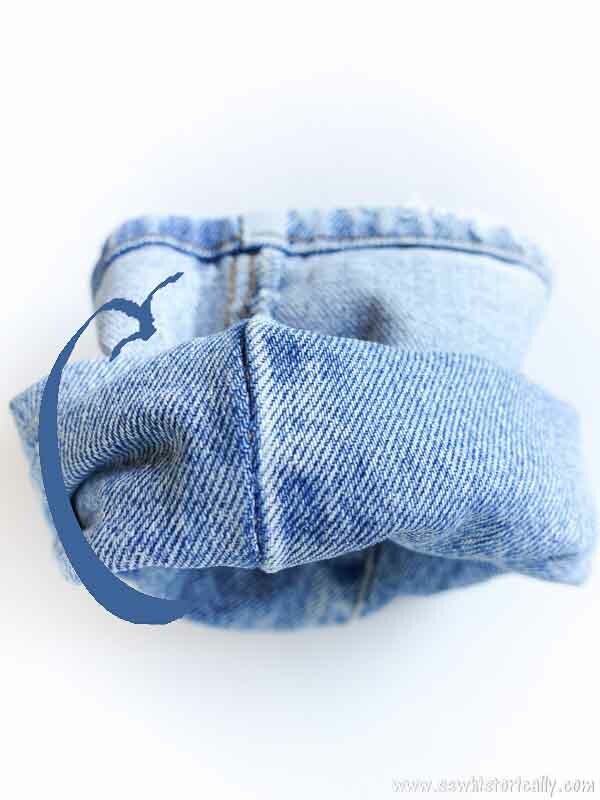 Great to use up old jeans and save the planet! Thanks for stopping by, Candy! 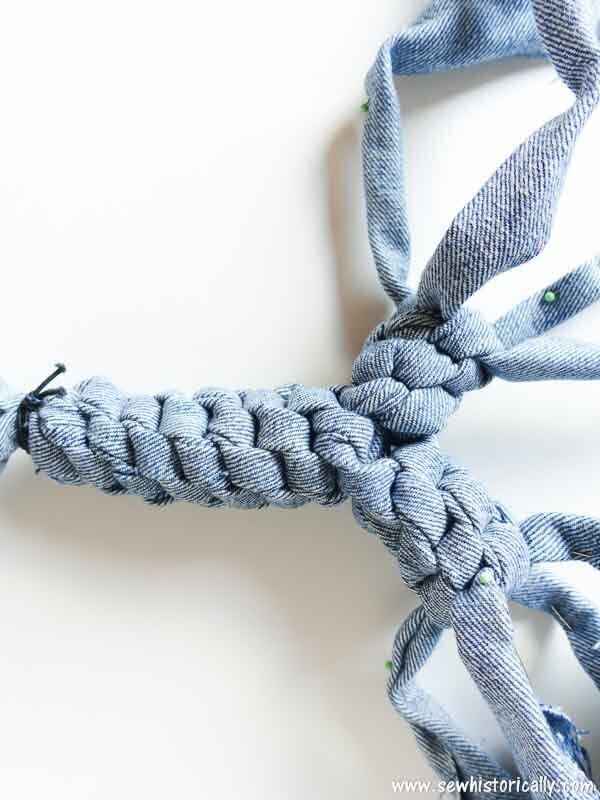 These denim dog toys are such a great upcycle project! I love crafting with denim. But I don’t have a dog! I’ll have to share this with my friend who has a doggy. I’m also going to pin this for later because I do eventually want to adopt a dog for my kiddos. So cool. I might try some of these. Great repurposing craft! We just got a new dog and he’ll chew on anything, probably even old jeans. Such great ideas and perfect for my grandpups! Thank you for sharing at Party In Your PJs! Thank you so much, Ann! I’m glad you like them! I don’t have a dog. However, your ideas are awesome and I am sure a great help for those with old jeans and a dog. We will feature your good ideas on the next Blogger’s Pit Stop. These are brilliant! 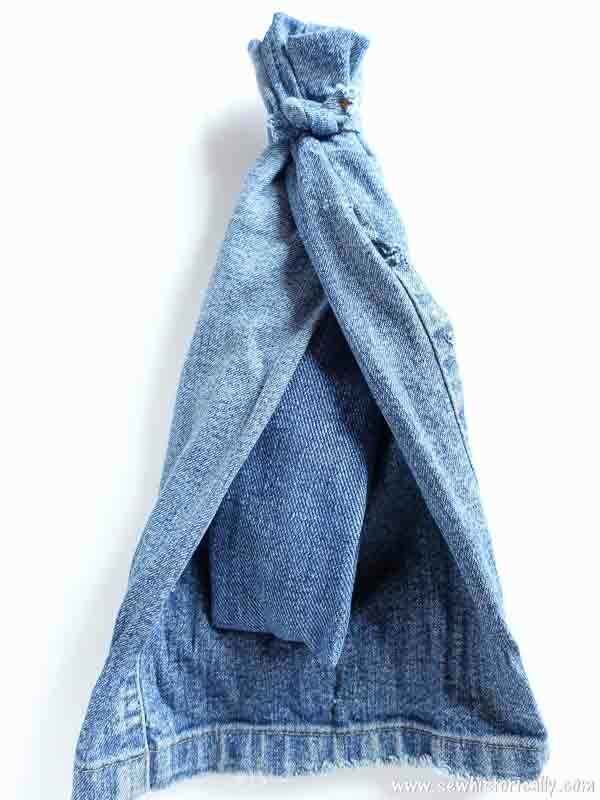 What a good idea for re-purposing an old pair of jeans. Dog toys are ridiculously expensive; this is a great alternative to purchasing them. These are great! I used to buy some similar toy at my son’s school craft fairs that were made of fleece and always thought ,”I can make these!”. Never got around to it. For those that don’t have dogs, check with your local rescues and animal shelter they might be thrilled to get toys for pups awaiting new homes. Thanks, Jamie! 😀 I’m glad you like them and great idea to donate them to animal shelters!